I'm new to RoboRealm, and I'm trying to use it to match parts from what would be a database of images, but the accuracy level is too low. I have not been able to increase it above roughly 70%, and in a database of hundreds or thousands of relatively similar pieces that won't fit my needs. I'm using a Kodak Dual D101, it's black and white and the images look as you can see in the image below. What I reallly need is any advice on how to better the matching in any way you can think of. P.S. If you have any questions as to the enviroment of the images or the specifications I'll try to respond as quickly as I can. I assume these are metallic pieces? It seems like the image you included is reflecting the light on the piece. Can you retake that with a faster shutter speed to lower the exposure time? 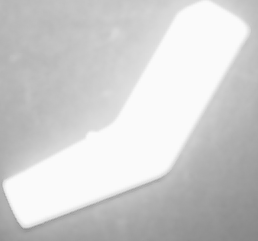 That should make the image darker but better show the edges of the part which is what you will be used to identify the part. Too much light is causing the pixels to oversaturate and cause blurring. The module to use will really depend on the parts and how they differ. Can you post 3 images of different but similar parts? That helps us understand what the differences are and what module might work best for those parts. Also, are there really a hundred thousand different parts that look similar to the above posted image? Or are they very different (i.e. non-planar, not all metallic, etc.). That's too many templates for most of the modules we have as you are probably looking for something that can identify a part within a second. For that many images, you are probably looking for more of a photo search type functionality ... but its not clear at this point.